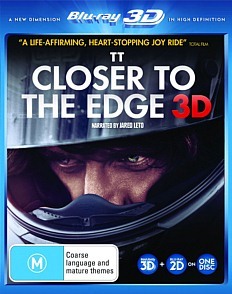 TT3D: Closer to the Edge 3D Review. With decent video quality that looks rather spiffy in 3D, great use of surround sound, especially during the races and a bevy of special features that are equally as enjoyable as the main feature, this Blu-ray release definitely gets the Highly Recommended stamp of approval! I have no inclination to watch motorcycling racing at all and couldn't think of anything more boring than to sit through a whole race... ugh! The ultimate torture! However... this all changed when I watched TT3D: Closer to the Edge on Blu-ray which not only took me behind the scenes of one of the world's most dangerous race circuits in the Isle of Man but it allowed me to experience racing at speeds of in excess of 300 kilometres an hour and more particularly in glorious 3D. Wow. With the inclusion of 3D, it really draws you into this documentary and when you see the riders racing through the narrow streets of the Isle of Man, it's like you're actually on the bike itself which makes this one of the most immersive experiences that I've seen on a 3D release for home viewers. However this release from Icon is not all about the racing as it also tells the human story behind this dangerous race as every year, a group of racers from around the globe attempt to become the "King of the Mountain" by completing this windy circuit first in order to be awarded the prestigious Isle of Man Tourist Trophy. This documentary that is narrated by Jared Leto who goes into the motivations of the racers in this film and basically what makes them "tick" and why they would risk their life on this deadly 15 miles of roads through towns and mountains. Ironically, over 230 racers have lost their lives on this track that began over a century ago. This is quite an informative documentary! The documentary also focuses on a small group of individuals that include Conor Cummins, a local from the region who has strong ties with the international Isle of Man Tourist Trophy Race plus other racers that include Guy Martin, Iain Hutchinson and undefeated champion John McGuiness which gives the film a real humanistic experience, even though it can be quite nerve biting at times. Director Richard De Aragues also divulges into the history of the race through flashbacks, statistics and interviews which really makes you question the sanity of these racers. However you must appreciate and acknowledge the skill of these racers because one false move or a corner judged incorrectly and it could literally mean the end of them. This is made worse through some of the flashbacks to previous crashes that are quite sickening to watch. However even with all the stigma, the locals still embrace this race and pull no stops for the 7-day event that has this mystical aura surrounding it. Unlike the Formula One or the V8 Supercars, the Isle of Man Tourist Trophy seems less commercial and is more about tradition and to some extent heroism which others may call stupidity. Even so, this is a very powerful documentary that will draw you in from the very first scene and hold you until the end. Just be warned that some scenes are excruciatingly never racking, especially when viewed in 3D. With decent video quality that looks rather spiffy in 3D, great use of surround sound, especially during the races and a bevy of special features that are equally as enjoyable as the main feature, this Blu-ray release definitely gets the Highly Recommended stamp of approval!